Some families are just born to race … and born to win and that certainly is the case for the Pocock’s with Bradley heading into this weekends huge Minibike World Championships as the main British hope for World glory. Hey I’m Bradley Pocock and race for cwbikes.com in the Minibike Champs a Minibike World Champs! I’ve rode minibikes for a very long time but on the klx110s in the woods with my brothers and mates but I actually got into racing it from my eldest brother Mel. He had a go on one of Callan’s CW bikes and said I should give it a go, so I did haha..
Pocock is a name mentioned quite a bit in Motocross are you from the same family? Yes there’s 4 of us brothers, Mel comes in at the top as the eldest then it’s me, Brett and The maff who you’ve seen in the MB110 group. It’s been a phenomenal Minibike Champs season for you so far, and it looks like you might put a stop to Frank Van Homoet’s 3 year reign in the Pro class you must be happy about that? Yeah for sure I’m well happy about how it’s going at the moment, leading the championship with 2 rounds left to go, its looking mega but it’s not over till the fat lady sings! That must give you huge confidence going into the World Champs? Yeah it definitely helps my mindset on the lead up to the worlds, but most of all I’m excited to get to race some new faces! As the number 1 British racer and with the WMC being in the UK are you feeling the pressure? The pressure is good for me, I seem to like the feeling of it all and most of the time it’s when I ride my best, but at the end of the day I’ll always line up on that start line and think it’s just another race I want to win regardless of the meeting. You run out of the CW Bikes awning how much support does Callan and the team give you? Them boys throw in maximum effort all the time, bikes are always ready from in between motos and they love it which in the main thing! Is this the biggest event you have ever raced in? There are racers from all over coming to compete where do you expect the biggest challenge to come from? I’m not actually too sure, I see everyone as a challenger and to be honest I’m just excited to race all these new people! 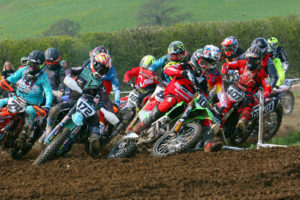 You have been known to stack it multiple times during a race but still come out the other side in front, is this down to over riding or just being in the wrong place at the wrong time? Your speed this year has been incredible, do you think the Fatcats track will favour your style? There has been a lot of talk about the fact that the UK races are longer than oversea’s, do you feel that your speed and strength at the end of the races could be the key? 100% you can be the fastest kid all day on laptimes but if your blowing at the end of a race it’s easy to make mistakes and loose concentration! The race can never be won on the first lap! There are some super talented British kids coming up through the MBC roots, who are your tips for World Champs glory in the Youth classes? Harry Lee for sure, the kid has a unique style for someone who only really just started racing on a Ktm 50 and for how he rides there’s not much left to teach him other than get that throttle on! ✊? Where on Social Media can we follow you?